Serving Southern California since 1988, Simi Flooring is Ventura County's largest and most popular flooring store, featuring top name-brand hardwood, laminate, tile, vinyl and natural stone floors, as well as a large selection of quality carpets. The showroom is located in Simi Valley, but flooring shoppers drive in from Moorpark, Thousand Oaks, Newbury Park, Camarillo, Agoura Hills, Oak Park, Ventura, Calabasas, and Westlake Village to take advantage of the showroom’s vast selection, low prices and best service. 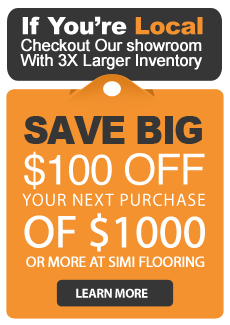 Simi Flooring is a proud partner with most name-brand flooring manufacturers, a powerful industry connection that enables our showroom to offer one of the nation’s biggest, best and most affordable selections of flooring and accessories. Visit today to browse all the major brands: Shaw, Mohawk, Armstrong, Provenza and dozens more. Then, take a minute to meet our knowledgeable staff and experienced installers. No job is too small or too big for our licensed and bonded installers. The store guarantees every installation for your peace of mind.